This proposal was designed by the international architecture firm AGi Architects to create a public space inside the museum for all the citizens to enjoy bringing about a new museum experience. Project's description: The city of Bucharest hosts a large number of remarkable buildings along Victoriei Street, which makes it one of the most important and attractive boulevards of the old city center. Buildings such as the CEC Palace, the National Bank of Romania or the University of Bucharest service the city. They give complexity to the urban fabric by superimposing layers of historical interventions throughout the years. These buildings furthermore have and still act as stage for daily activities; this has gone on for many years and can continue to cater to the citizens for generations to come. In that sense the proposal understands the street as the layer which links the different façades and public spaces of the neighborhood, only this proposal invites the public experience inside the building. A public space inside the museum will open it for all the citizens to enjoy bringing about a new museum experience. The intent for the museum is to take an active role in the daily lives of the people. A new museum experience that will not only educate about the history of the city of Bucharest and the whole of Europe, but it will also create and internal history within itself. The visitors of the museum now become both viewers of the exhibits and contributors to the construction of a collection about the museum. As a consequence of this proposal and at a closer scale, a new corridor of public space is opened between the new museum and Saint Demetrius Church. The green space near the Church is also linked with the museum and Victoriei Street, thus establishing a new area that can be potentially revitalized into new pedestrian circulation for the people. 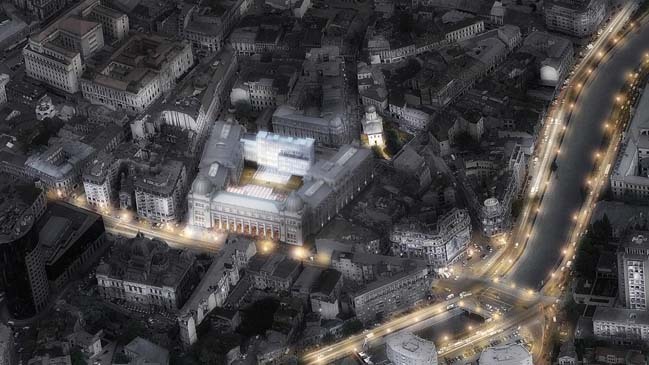 This perpendicular axis could in turn create a profitable intervention by drawing the visitors towards and through the museum creating an attractive location in the old city of Bucharest. Holistically the architectural intervention being proposed is divided into four main arrangements combined to give the final result; In the first arrangement the project is brought to its original state (Alexandru Savulescu, 1894-1899), by removing all rehabilitations and emptying all superfluous building elements that had formerly fragmented the different spaces. The resulting building would be that of the old Palace of the Post, which is considered to be the ideal starting point of the new proposal for the museum. The second arrangement aims to solve the programmatic issues. By opening the exhibition spaces in the three main wings of the building and having a fourth wing which will facilitate the different functions of the building. This fourth wing would house all the backstage activities of the museum acting as the engine of the whole building. In the third arrangement a new programmatic piece is proposed. This piece is meant to reinforce the facilities building and serve as hub for the rest of the museum. 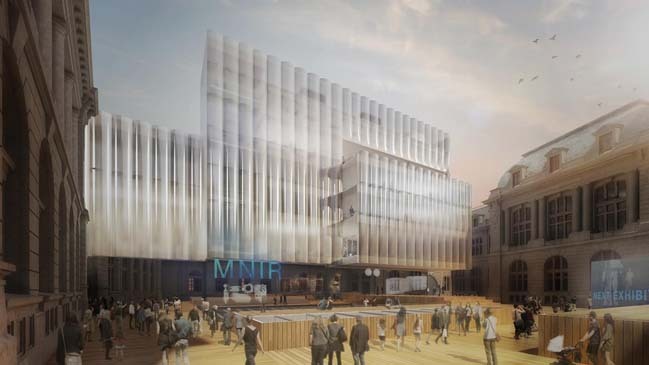 Included in this proposal is the façade of the building acting as the stage curtain for all the activities hosted in the main plaza, as well as research labs and workspaces that are the fundamental link of the museum’s chain. The final arrangement is the new concept of the plaza. The reintroduction of the plaza gains significance when it is relocated at a lower level making it visible from all the levels and wings of the museum. The central plaza will mediate all the circulations allowing the main focus of the exhibition pieces to be the historic treasure of Romania with the Trajan columns being the main attraction. The plaza becomes a flexible space that can act as an extension of the indoor exhibition spaces or even housing thematic or seasonal exhibitions. Flanking the sides of the plaza would be the museum shop which will allow constant revenue coming into the museum.